Review by Deborah Klens-Bigman, Ph.D. I hate watching swordsmanship videos. Leaving aside that I have trouble finding up to two hours to sit still in front of the VCR or DVD player, the videos very often are of poor quality and present dubious information, and even worse technique, which means my time is usually wasted. If you put two hours of tape-watching against two hours of actual practice, I think the time is much better spent practicing. Therefore, when I was asked to look at Hidden Secrets of Japanese Swordsmanship, I considered the redundant title (if they weren't hidden they wouldn't be secrets) and thought, oh no here we go again. I was pleasantly surprised. Though I still think the title is poorly chosen, the content of Hidden Secrets is surprisingly good. The video is exactly what it claims to be: a survey of the twelve kata of the shoden set of Muso Shinden ryu iaido, the Omori ryu. Roger Wehrhahn spends no time whatsoever on the origin or background of iaido or Muso Shinden ryu; given the dearth of real information in English out there, it's too bad, but at least the tape avoids romantic hyperbole common to some other efforts in the field. After a few preliminary points about sayabiki (pulling the saya (sheath) back with the left hand during drawing and resheathing), proper grip of the sword, and the various noto (methods of sheathing), Wehrhahn proceeds to the business at hand with no further digression. The kata are clearly presented from both front and side views, followed by the bunkai (application) for each one. The best part is that the technique is very well done. Finally we see a tape created by someone with some real experience in iaido (Wehrhahn commenced studies with Mitsuzuka Takeshi in 1984), and it shows. The "Mitsuzuka line" has some variations from other major teachers; however, the variations are minimal in the context of the style as a whole. Wehrhahn does not crowd the audio track with his own assumptions; what we see are the actual forms, simply and elegantly presented, with commentary confined to technical aspects. The video is both clear and well-audible. The backdrop is the Anshin Cultural Center in Massachussetts, and it is suitably austere. My only quibble is that the bright lamp in the tokonoma provides some distraction from the business at hand. Maybe subsequent video installments could replace the lamp with a suitable flower arrangement, or nothing at all. As always with martial arts media (books included) I like to consider who the intended audience is. Though people keep trying, anyone who knows anything will tell you it is impossible to learn martial arts from a book or video, no matter how clear or well done. Nuances are lost, and especially, any philosophical or meditative aspect is nonexistent, not to mention the possibility for any growth on the part of the video "instructor" or practitioner. Therefore, the tape is suitable for anyone with an interest in swordsmanship and wishes to become better acquainted with the subject rather than as a guide to starting one's own practice. Beginning students of Muso Shinden ryu iaido, under the guidance of a teacher, would find it a valuable reference as to what the shoden forms should look like, even with minor stylistic variations. 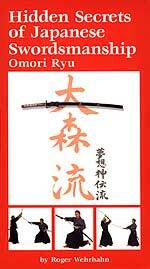 Muso Shinden Ryu is not practiced as much as other styles of Japanese swordsmanship in the U.S. Therefore, practitioners who don't have the benefit of a regular teacher would also find Hidden Secrets a valuable resource. I look forward to the rest of Wehrhahn's tapes on Muso Shinden ryu.